Walking into Thomas Dunton Solicitors, a thriving, dynamic legal practice on Orpington High Street, you would be hard pushed to imagine its roots. Norman Thomas Dunton grew up on the wrong side of the tracks in Hackney, East London. He left school at 14 and worked in a solicitors firm as an office boy. After returning from service in World War II, he found work at a City law firm. One day in 1962, at the age of 49, he decided to train as a Solicitor. With a wife and a young family to support, college was not an option, so he enrolled on a correspondence course and studied at home in the evenings, emerging as a fully qualified Solicitor six years later. 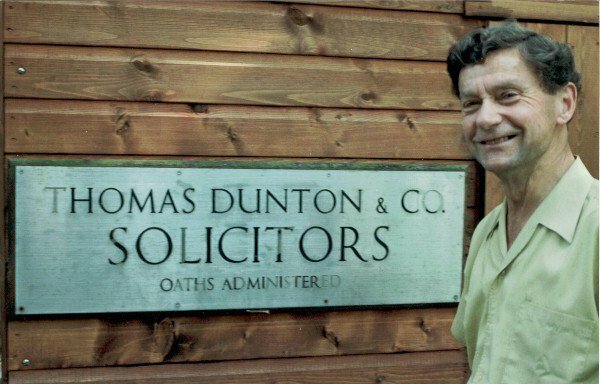 Thomas Dunton Solicitors was officially born when Norman was 65. He practiced from home for several years and then, when his daughter Melanie joined the firm, he moved into a small office. A man with a deeply felt social conscience, he once said that among his greatest pleasures in life was seeing someone walk in through the door, weighed down with a problem, and know that he was able to help them. Forty years on, this ethos is still very much part of the firm, the question “How can we help you” being the cornerstone of the Thomas Dunton philosophy. Above: Thomas Dunton, the man who started it all. Carrying on the family tradition from her father, Melanie Dunton is now a Senior Partner at the firm. Joining in 1986 and initially working in all areas of the law, as the firm expanded she headed our Family Department and specialised in finance, pensions and mediation. She now heads our Private Client Department assisting clients with the financial aspects of wills, trusts, taxation and probate. She is also a Family Mediator. Melanie’s fellow Senior Partner, Vernon Hadida, joined in 1992. With a Physics degree and having further qualified as a Chartered Physicist, after five years at sea as an engineer in oil exploration, Vernon re-trained as a solicitor. As well as his experience working in industry outside the law, Vernon brought to the firm three years’ experience of working in a City of London law firm, where he trained and practised. Now head of Dispute Resolution in the firm, he is a CEDR accredited mediator and also plays a large role in running and planning the affairs of the practice. Tessa Bengo subsequently became a partner in the firm in 2002, bringing a wealth of Family Law experience. Specialising in Children Law and financial issues arising on relationship breakdown, she now heads the Family department. The partners are fortunate to have been joined by a team of highly experienced lawyers and committed support staff. Having become a leading Kent-based firm of Solicitors, Thomas Dunton provides a wide range of services to both private individuals and businesses, and their reputation is founded on a tradition of care. Whatever the problems, the team will assess what each particular situation requires, whilst also considering the wider picture. Their aim is not just to resolve the immediate issue, but also to protect your future interests. We have attained Lexcel status, which is the Law Society’s quality mark for excellence in legal practice management and excellence in legal client care. Since it was introduced, little more than 16% of solicitors in the UK have achieved this distinction. In addition to Lexcel, we also have eight Law Society accreditations. In a changing world, one can never be sure what the future holds, but whatever your situation and the issues you face, Thomas Dunton will provide the expertise and personal attention you need. Our policy focuses on supporting the local community we serve. We are committed to supporting local organisations and the community in general. We try to offer work experience as far as is practicable and have links with the local college. We provide free talks on legal subjects to local community groups and are now in our 7th year of presenting free monthly talks at Orpington Library. We belong to the Bromley Dementia Action Alliance (BDAA) group and Dementia information sessions are a part of our formal induction proramme for all new staff, most of whom are Dementia Friends. Printer and copier toner cartridges. A large proportion of correspondence is via email, saving on paper consumption. The building is also heated in as an environmentally way as is possible by using a timed thermostatic heating system in place. Thomas Dunton also donates to various charities, local and national, and raises money for these at local community events. Thomas Dunton belongs to the Federation of Small Businesses, which emphasises trading locally and also Orpington Ist, which is instrumental in pushing forward positive action to encourage the growth of the town. The partners are responsible for any matters relating to the reputation of the firm, with Vernon Hadida being responsible for this policy. This policy is reviewed at least annually to ensure it is in effective operation.